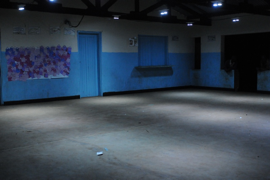 Solar Lighting Project: A report by Paul Sigmund, Ministry Of Hope, to Morristown Rotary Club regarding their $2,500 grant. Ideas sometimes arise unexpectedly. 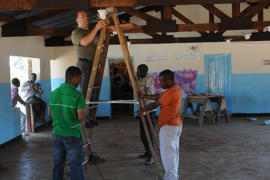 During the first week of last year’s trip to Malawi, we constructed swing sets at MOH's feeding centers. Mid way through the second week, as we were enjoying the African sunset after the day’s work building a gravity drip irrigation system for a vegetable garden, I was struck by the suddenness via which the sunset plunged into total darkness. As the sun fades, without electricity all activity at the remote feeding centers comes to a halt and the kids MOH serves quickly leave for home in the surrounding villages. What a difference a few electric lights might make! I was moved by the prospect of initiating solar powered electric lighting. Kwamba's child feeding center seemed the most remote, and the most impoverished of MOH’s centers. Where might be a better location to initiate something capable of dramatic change? 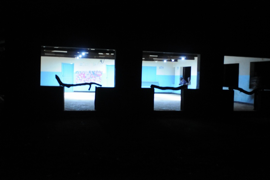 My hope was that a few electric lights could provide opportunity for after- sunset utilization of the centers to educate kids, for adults to meet, for community activities to be held. Preliminary calculations suggested we could illuminate a significant fraction of the center’s open floor space using two 50 Watt solar panels, a size just within the limiting dimensions of checked baggage by our carrier, South African Airlines. 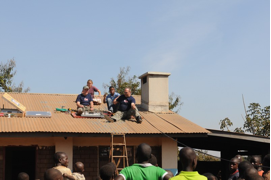 Because the availability and quality of solar components in Malawi was an unknown, and determined to connect and test a system at home first, we carried the panels with us. Solar generation works by gathering energy from the sun during the day, converting it to electricity and storing it in a battery, and then controlling the withdrawal of energy from the battery as it is utilized at night. Designing and constructing a system requires careful attention to solar panel position, firm mechanical attachment for security, electrical control design, and lightning and personal protection. The directional bearing of the panels, as well as their vertical angle, must be at optimal values to maximize energy gathering as the sun’s position changes during the day. Optimal mounting angles are based upon the specific location on the globe, and often necessitate elaborate mounting. Amazingly, the Kwamba center was orientated, and the roof constructed, at exactly the optimal position! All we had to do was to attach the panels to the roof. It was an ideal location! To maximize lighting illumination utilizing only 100 watts of power each day, conventional light bulbs were not an option. 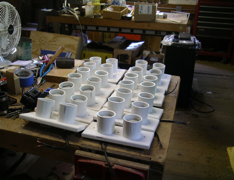 Instead we innovated custom light fixtures employing LEDs, each providing the illumination of a 100 watt incandescent bulb while consuming only 4 watts of power. Our other objectives were to provide a way for the villagers to charge cell phones, and to initiate a means for them to obtain and recharge battery powered lanterns for use at home. Currently they walk many miles and pay to have their phones charged. Many people can hardly afford kerosene to run a lantern, and those who can commonly suffer respiratory ailments from inadequate ventilation of the fumes. Advance planning and preparation paid off. Our installation proceeded smoothly over a three day period. With the usual determination of MOH’s volunteers, the panel frames we had fabricated fit perfectly to the corrugated metal roofing, and we snaked the wiring through the space between the roof and ceiling in a secure store room. It became quickly apparent that the above-ceiling crawl space was home to unseen creatures squeaking, scratching, and flapping in the darkness. Once the light fixtures were strung between the trusses in the main area, and the final wiring was completed, it was time to throw the light switch for the first time. I flipped the light switch, and the new lights above the heads of all the children suddenly came on! You should have heard the exclamation of surprise and joy spread across the floor! I’m sure bright lights, even in daylight, was an experience few of the children had ever experienced! 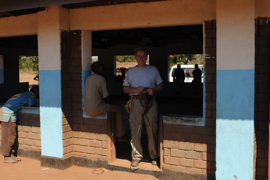 For my daughter Diana and I, this was our third trip to Malawi. A highlight of this year’s trip was spending a night together at the home of Felix, Kwamba’s center director. 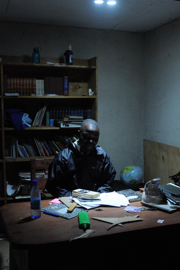 We witnessed what it is like to cook dinner over a tiny charcoal stove, for a child to try to read a book by candle, for people to meet or do anything meaningful, all in the blackness of an African night. What an impact it made to break the enclosing darkness in the tiny courtyard between house and cooking shack, with the battery powered lantern we had carried from the US to pilot the lantern recharging operation. What a difference a beacon of light made for Felix’s wife cooking dinner, for simply sitting outside under the stars to read or play a game, or to enjoy dinner indoors around the household table. Suddenly nighttime became much less oppressive, and much more productive. After dinner, we walked back to the center, and brought our lantern along, to guide the way through the darkness. When we arrived at the center and switched on the lights for the first time in the darkness of night, the effect was stunning! We simply stood there in the bright light, absorbing the experience, for a very long time. Very few words were spoken. It was amazing! We all felt we were witnessing something very special. MOH’s new Executive Director has developed a long term program to utilize the new solar facility at Kwamba as a charging kiosk for battery powered lanterns and cell phones. Villagers will pay a nominal fee to rent the lanterns, and charge their cell phones. The fees will be saved to cover equipment replacement costs, and to compensate a manager of the solar facility. The underlying objective is sustainability. Value will be preserved as people invest in the program, and the concept of retaining income to facilitate future expenses will hopefully be applied to life in other ways. Even broader change may initiate. 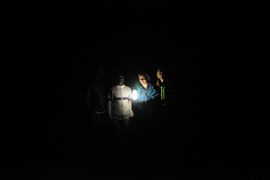 In order to pilot this program, we had carried 4 battery operated lanterns from the US. There are rechargeable lanterns available of many quality levels, and while the model and brand we chose for this pilot installation were not the least expensive, they were waterproof, US made, and boasted an 8 hour battery capacity. They proved a wise choice during our stay. At the end of this year’s trip, we met again with the director and agreed a reasonable next-step objective for 2012 would be to add solar electricity capacity beyond the center lights to handle 25 lanterns, and 12 cell phones. We’ll complete the engineering to quantify and plan how many additional solar panels, and solar batteries, will be required for this expansion. 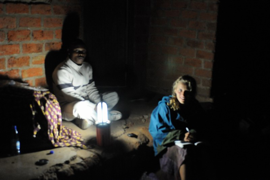 It is my hope that when this story is told, many will come forward to “support a lantern in Malawi”. I’ve seen them make a life changing difference. And I know the experience was life changing for me.